« Newbs Stimulus Plan Giveaway! Foreward: Okay so you took the bait. This is a bit of a glory/brag blog post.. But I worked HARD for it and i’m quite proud of meeting my goal. I’ll tell you how I did it, and give you some tips that I learned along the way. Okay so now that we got that out of the way.. Onto the story. So if you’ve been following the blog like a good Newb you’ll remember my ‘Newbs Recap’. A story of my return to TF2 along with some Newbs history.. Well consider the next chapter to my story. So I thought hey, how about trading some hats? I’m way behind the times with no vintage hats.. And only a Bills hat to trade. Well I waited until I saw something I like and said hey, Demo man.. That fro looks mighty dapper, how about I trade you my Bills hat for it? Instant trade. Sweeet.. a DEMO FRO.. Boy TF2 sure is fun. Yeah.. wasn’t long after that I read Crap’s post about how Bill’s hat was worth 3-4 hats that my love of the trading system faded. ‘Wait what? Bill’s hat is worth.. Motherf..’ So naturally I had to figure out what was hot and what was not to never let this happen again.. And that’s where things really got crazy. Trade servers, fancy WoW-esque trading lingo.. And steam forums of course. Craigslist for TF2. I hadn’t really seen an unusual at this point, so I didn’t realize how badly I needed one.. I saw a TF2 logo, a circling heart.. Flies. Hrm, novel but not all that exciting. Until the day.. I saw an Unusual Chieftain with Burning Flames. holy. sh mackerel. So naturally I trade the guy. Like UHH YEA.. and I add everything I have into the trade box hoping he’s as excited by my milkman, demo fro, crates and a name tag as i am and just gives me that awesome hat. ‘LolZ I ned Luk 30-40 haotz noob, or luk, 4 unueusleasz’. Motherf.. So yea that was about 3 weeks ago. 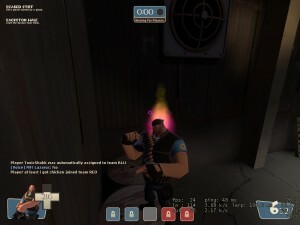 Since then it has been my unyielding goal to obtain a burning flames unusual. Why? I’m not really sure. Was it to get the ‘last laugh’ with that fine gentleman in the unusual trading server? Was it so I could sit on said server and laugh at all those who try to offer me crate hats for it? No. Pretty sure it was only because of how Badass it looked. Sure, I get 6 or 7 kills, steal your intel.. air shot you as you’re dropping off battlements. Happens all the time. BUT, doing it while having your head on fire? THATS SOMETHING. So for the last few weeks i’ve been hustling this and that, one of these for 2 of those.. And working my way up the ‘backpack ladder’ so to speak. Get a max set, then another.. Then SOLDIER medals are tradable oh gawd.. The rarest most un-noticable item in game I NEED one of those haha.. Ear buds? Sha.. Who wouldn’t want to have little musical notes magically falling from your head. Finally the day arrives that I’m ready to go after an unusual. This is not for the faint of heart. 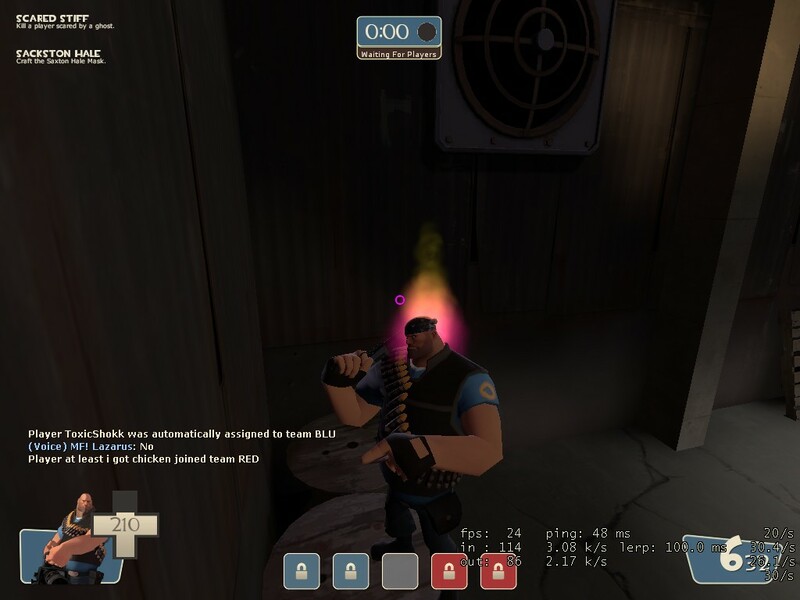 I do not recommend this to any sane TF2 player. It’s a jungle out there. Hustling hats is one thing, but unusuals are just nasty. The evil in people comes out. Scam artists, paypal for hats, steam games.. A dark underworld surrounds me. The items you thought were so awesome, and so sought after apparently are only worth 1 refined here. If you’re lucky. Oh god don’t bring up the luger. Whatever you do. Chat spamming, Mic spamming, 12 year old kids yelling. This is an unusual trade server. Don’t believe me? Wait on autojoin for 5-10 minutes and see what waits inside. It was at this point that trading stopped being fun, I was in over my head. Surrounded by the very things that ruin the game. But my quest was noble.. I just wanted a Badass hat. Is that so wrong? Time was of the essence. It was at this time I realized you can’t break into the unusual market with max’s set alone. Oh no, you need a starter unusual. One with a good effect, but has absolutely no value to you. Because it’d be too easy to get what you wanted right away.. Now wouldn’t it. Doesn’t advertise hats, merely wears them around while taunting. Will Cancel a trade with you if the first hat you include in the trade box isn’t amazing. Will laugh and harass you on mic if it’s a halloween mask. It’s important to understand the ‘unusual hat dealer’ because he inevitably will hold what you value so dearly. He will know this. And he will exploit you. Don’t let that happen. Aha, you thought I would share ALL of the secrets of the Unusual underworld in just one blog post? That would be too easy my friend. Too easy. Tune in next time for the conclusion of *dundundun* From Demo Fro to Unusual. This entry was posted on Wednesday, November 10th, 2010 at 6:09 pm	and is filed under Newbs, News. You can follow any responses to this entry through the RSS 2.0 feed. You can leave a response, or trackback from your own site. Oh god, I can’t wait. I NEED PART TWO NOW! Let me know what you think, feedback is appreciated. I can`t wait to get my first unusual thanks for the great post jib!